In the winter of 1981, a scrawny, Brooklyn-born twelve-year-old kid by the name of Michael McLeer hung from the beam of an elevated B train. Spray can in hand, sneaker against steel, he felt spraypaint adorn the surface of an MTA train car for the first time. When he wrote the name KAVES, he penned the beginning of a folklore that spanned New York City's restless, crumbling, hip-hop fueled 1980s and 90s. Over the era, Kaves, a "Brooklyn boy who makes good" took paintings from traincars to museums and galleries. He took hip-hop from the crackle of his boom box radio into the unwelcome lap of the neighborhood he loved. Eventually, McLeer and his brother pushed things a step further and created the pioneering rap/punk-rock group Lordz of Brooklyn. Fueled by the same incessant need to create and influence that brought him to the tunnel of a train track, McLeer brought hip-hop culture into a prominently Italian-Irish Southwest Brooklyn. In the years to come, the group would gain critical acclaim and respect from the neighborhood and from the world. From Bay Ridge to Japan, Kaves left his mark in paint and lyric, going against the grain without pause. Fifteen years ago, McLeer began to veer his prodigal career as a graffiti artist, fine artist and musician into the realm of tattooing. It didn't take long before Kaves was transferring artworks on canvas and concrete into artworks on skin in the heart of Brooklyn's Bay Ridge. The rest is history. After owning and operating a number of growing tattoo parlors in his home neighborhood, Kaves finally planted the flag in the ground of 312 93rd Street- creating Brooklyn Made Tattoo, which is his most beloved shop. Since 2008, Brooklyn Made has become more than a tattoo shop. Proudly tucked around the corner of Bay Ridge's bustling 3rd Ave, BMT has become a local staple and a hub for artists, creatives, friends, neighbors, comedians, eccentrics and celebrities alike. 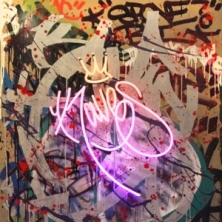 Never at rest, Kaves utilized his boundless energy and well-oiled savvy over the years to knock down the doors of several major brands, becoming their go-to street artist and trend forecaster. Kaves has designed exclusive visuals for Jaguar, NIKE, Rockstar Games, WWE, PONY, MTV, ADIDAS, Van’s Warped Tour, Georges Duboeuf- for whom he created the label for 2011 Beaujolais Nouveau- and many others. Kaves has also created logos and graphics for world-renowned artists such as the Beastie Boys, Metallica and House of Pain’s Everlast. His images have been published in books including Henry Chalfant’s pioneering 1984 chronicle Spraycan Art, Burning New York, Mascots & Mugs: The Characters and Cartoons of Subway Graffiti, Fresh Paint NYC, Graffiti Planet 2 and Piecebook: The Secret Drawings of Graffiti Writers. His own premier book, Skin Graf: Masters of Graffiti Tattoo, was released on April 25, 2013 through Prestel Publishing. Kaves’ paintings have been shown everywhere from the MTV Real World: Brooklyn loft, as well as the Gunter Sachs Museum of Fine Arts in Germany, The Blackstone Hotel in Chicago, Illinois and the Rock and Roll Hall of Fame in Cleveland, Ohio. His first-ever New York City solo show during the summer of 2011 at the Hionas Gallery garnered overwhelming critical acclaim and saw collectors clamoring for works by the former vandal. Kaves' energy and thirst for creative expression took him to the world of acting and filmmaking. In 2006, Kaves created, produced and directed The Brooklyn Way, a multi-episode docu-series about his family’s life. The show incited a remarkable regional groundswell during its first season on Madison Square Garden’s MSG Network, and was then picked up by FUSE for national distribution. Wasting no time, he dove into writing the screenplay for a romance between a starry-eyed shoemaker and a taxi dancer in 1950s Brooklyn. The Shoemaker- which starred big-league actors Burt Young and Peter Greene- came to win Best Short at The Art of Brooklyn Film Festival and was an official selection in the New Hampshire Film Festival. From 2011 to present day, Kaves has been starring in short and feature films including The Humdinger, Donnybrook, Star, and The Eulogy. 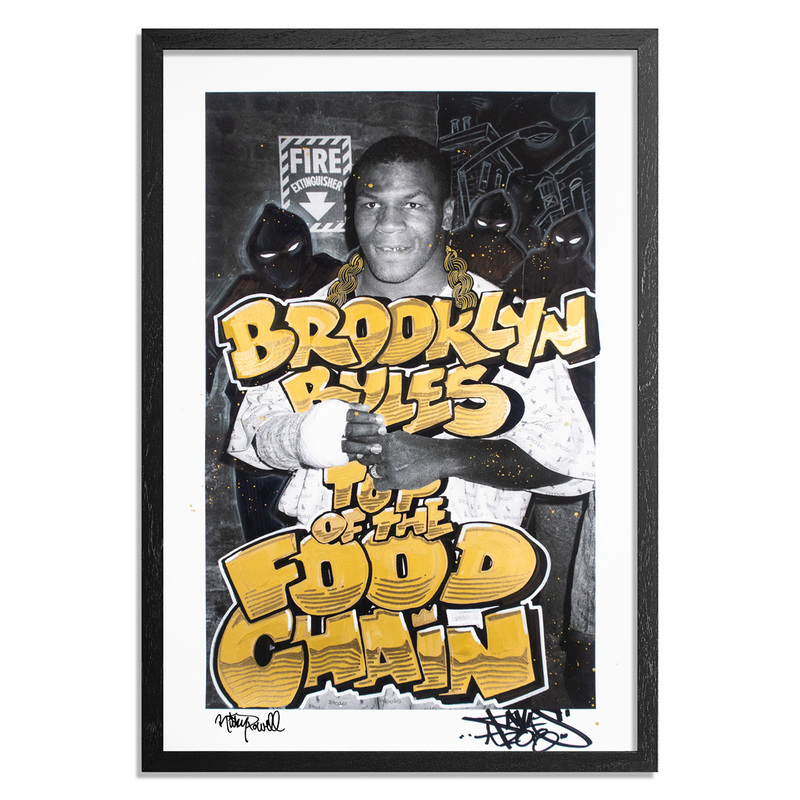 Brooklyn Rules - Top Of The Food Chain - Mike Tyson. Pitbull Off The Leash. NYC. 1988.